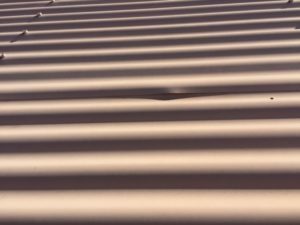 During the response to Tropical Cyclone Debbie we paid close attention to roof uplift. 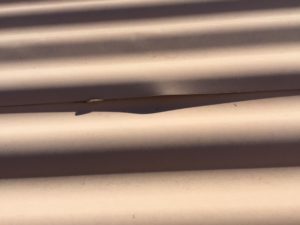 As you can imagine, an incorrect assessment of the roof could mean the difference between putting a new roof on when it is not required or leaving a damaged roof in place when it should be removed. As wind moves around a structure, it applies pressure and suction to all external surfaces of the building. 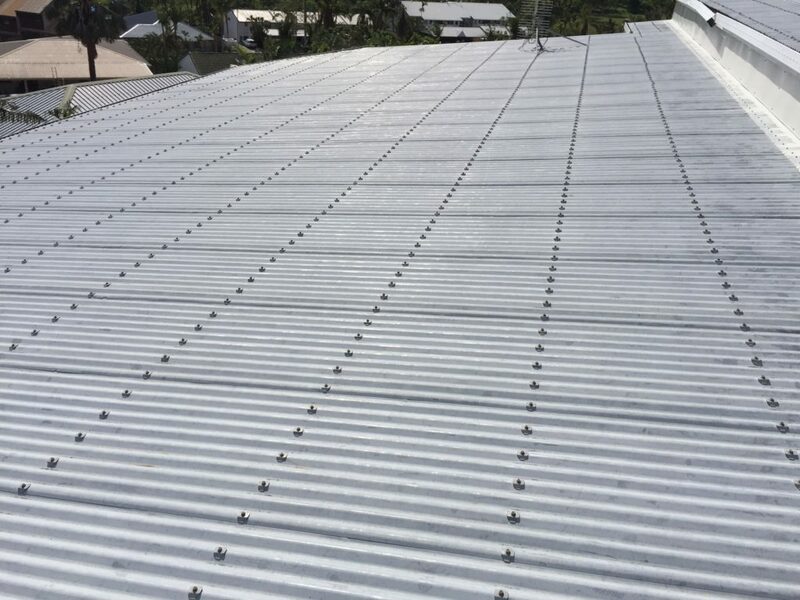 The Cyclone Testing Centre at James Cook University has identified that “Wind pressures acting on roofs are actually fluctuating, large amplitude and repaid with time. The fluctuations in pressure are due to two separate but interacting flow phenomena – firstly the natural turbulence or gustiness in the wind, and secondly the local pressure fluctuations at sharp corners and roof-wall junctions where the flow separates from the surface, and vortices and eddies are formed” (Technical Report 37, p1). 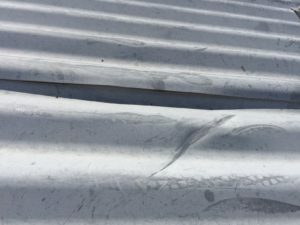 In this 50 second video produced by the Cyclone Testing Centre, the Air-Box test shows the impact high turbulence and high suction from severe wind events have on roof sheeting. When an external windward facing wall is being impacted by the approaching wind, it is pushed inward and all other surfaces generally have suction on them pulling that surface outwards. These pressures act directly on the cladding material and are transferred to the structural elements underneath them (QRA, p6). 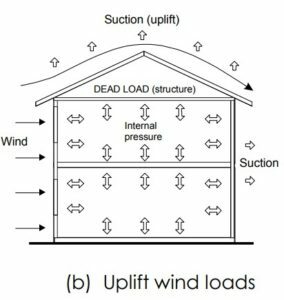 If the windward facing elevation sustains damage and doors, windows or storm created openings allow wind into the structure the internal pressures increase and push upwards on the underside of the roof and this effect adds to the upward forces caused by suction (QRA, p6). Where an opening is caused on any other elevation, the internal pressure will be low causing suction on all internal surfaces, significantly increasing the load that must be resisted by the structural elements (QRA, p6). The Building Code of Australia requires buildings to be designed and constructed to resist the design wind forces. This means that all cladding, windows, doors and garage doors must be built to resist the possible combinations of design wind pressures at the design wind speed. It also requires all structural elements to be designed and constructed to resist the wind pressures. 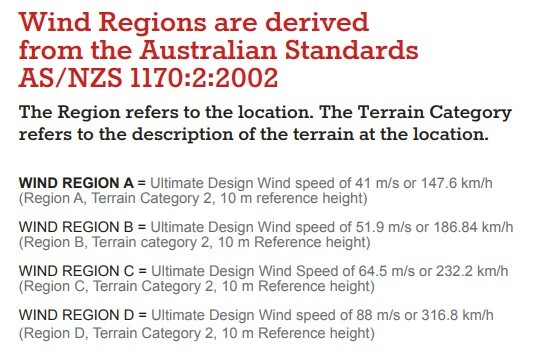 Every house in Australia is wind-classified based on the wind region and site conditions it is exposed to. 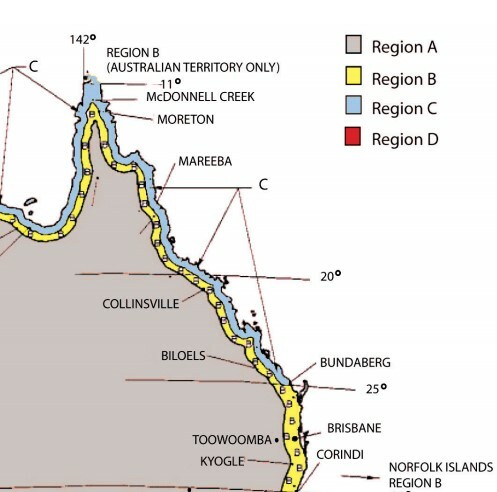 Tropical Cyclones that cross the coastline in North Queensland do so in Region C.
Below is a common example of where the hardwood batten has pulled away from the rafter due to uplift. This property in Sproule Street, Bowen was attended by Ambrose Building in the aftermath of Tropical Cyclone Debbie. The uplift at this property was evident in the outside veranda area and in the roof cavity. As was shown in the James Cook University Air-Box test video above, the fluctuations in turbulence or gustiness can cause the sheet laps of the roof to lift under the force of the winds in the cyclone. 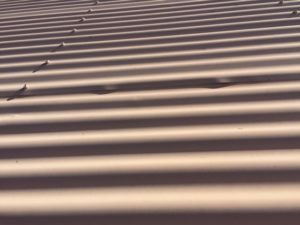 This property in Cannonvale is exhibiting those exact consequences where the sheet laps are easily identifiable when looking along the roof. 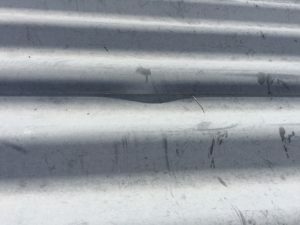 Due to the force, the roof sheet has lifted and caused the sheet lap to bend and in the below image the damage to the sheet is easily identified by the shadow that is cast due to the location of the sun at the time of inspection. Below is perhaps the easiest sign of uplift to identify where the screw and fastener have been lifted. 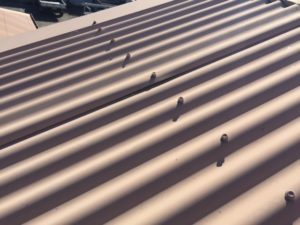 As the roof sheet has dropped under normal gravity forces, the screw and fastener have remained raised away from the roof sheet. 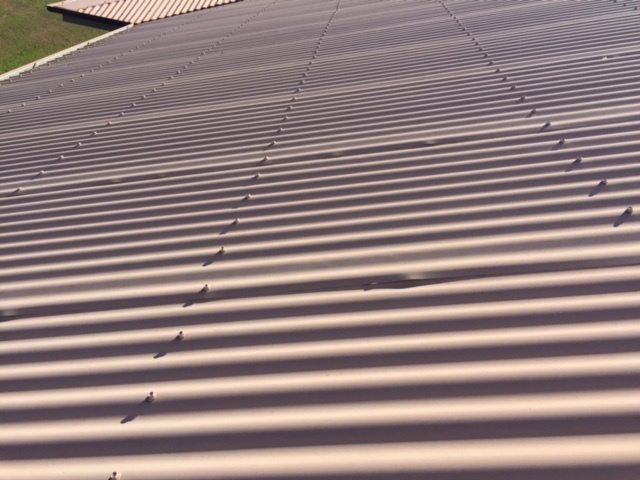 The below roof from Mackay also shows evidence of uplift evidence at the sheet lap. 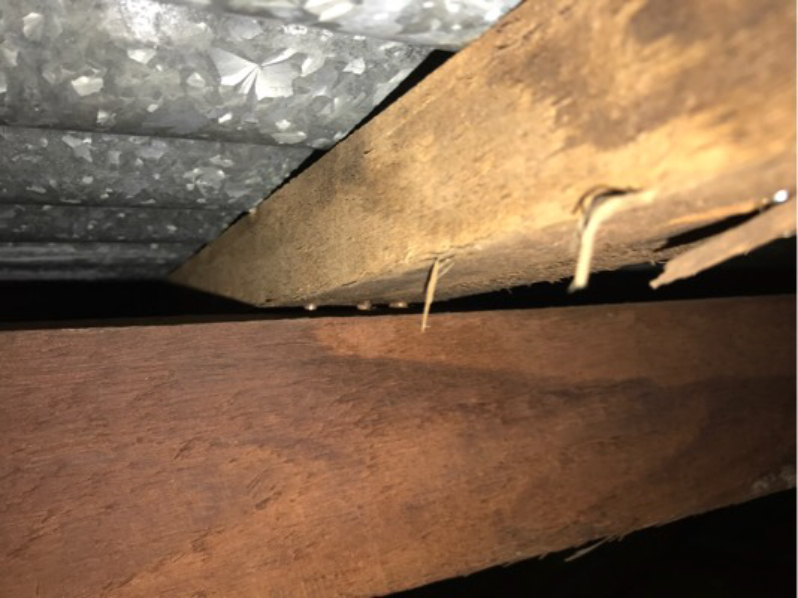 Where part of the structure has been damaged and the elements have failed due to their own weaknesses, consideration must be given to replacing these elements with stronger more appropriate elements to prevent similar damage occurring in the future. A like for like replacement will only return the property to its previous weak state and do nothing to increase the resilience of the structure to protect it against future events. Interestingly, consideration must be given to the whole structure. If a weak point is strengthened but elements elsewhere are left unimproved, the probable consequence is the weak point will be transferred from one element to another. For example, if a cyclone rated garage door is installed and nothing is done to increase the structural integrity of the surrounding wall frame, while the garage door is now strong, the building could fail at either side of the door installation as it now provides a sail like catchment moving the forces from the door to the surrounding structure. It is well known that roof battens must be anchored to the rest of the structure to carry all of the forces applied to it during a natural weather event. Houses built prior to the 1980’s may not have had the battens anchored to the rest of the structure, thus placing them at risk of uplift. For houses in areas rated as medium exposure (C3), straps or framing anchors must generally be used to deliver the higher strength required. A typical house structure relies on multiple continuous chains of tiedown elements: from the roof cladding, through battens, trusses or rafters, into the walls, down through the walls and into the subfloor structure including the footings. 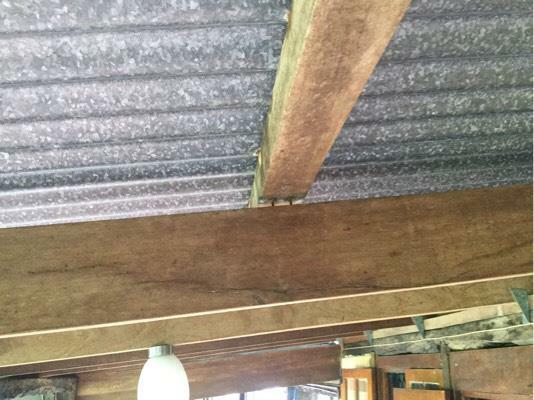 Tie-down rods in timber framed construction and steel frame elements transmit uplift forces from the roof down through the wall structure and eventually to the ground. Wall systems must be correctly anchored to the subfloor including concrete slab for slab-on-ground construction. Particular care is needed at the sides of openings as higher forces can be transmitted there. The required anchorages for your house are determined by the wind classification and the area of the structure that contributes load to the building element. Some alternatives are given for each element in the tie-down system in AS1684. Section 61, 80 & 81 of the Building Act 1975 requires the assessment of Building Work on existing structures and as a result if more than 20% of the structural replacement of these components is required the assessment needs to consider the current provisions of the Building Code requirements for compliance (National Construction Code). 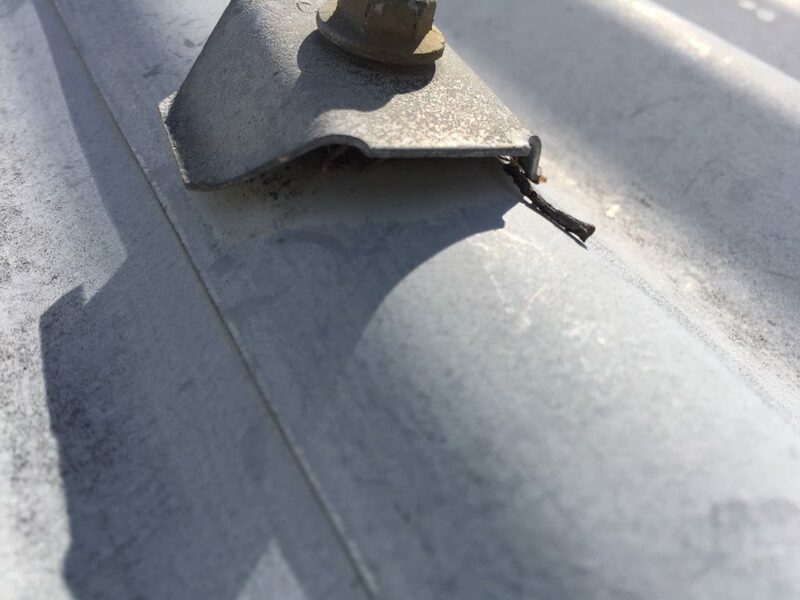 Therefore if 20% of the structural element is required to be replaced full tie down would be required, with bracing calculations and engineers design as part of the Approval. High wind induced uplift is a serious consideration for all insurance repairers. Clear understanding of the indicators of uplift across the entire structure are critical for identification by Estimators and Assessors. Seeking early advice from Engineers and Private Certifiers is vital to ensure that the repair is completed to code and all weak points are identified and considered for either private upgrade or covering as part of the insurance repair to ensure the overall resilience of the property is increased.